We had heard a rumour of a Scotland away friendly in France. Just a rumour, but the wheels started turning. The Sunshine Appeal is proud of its record in donating at every away match since Lithuania in 2003, but it can be difficult finding an appropriate recipient charity if a match is sprung on us with little notice. But, a rumour is a rumour, and it would be foolish to ignore it. I put my hand up to co-ordinate this donation. Well, I like France. I’ve spent several holidays there and I speak a wee bit of the language. There’s also the Auld Alliance. And wine. I’ve never been known as one who likes to keep all the work to myself, so I contacted Didier Martinet for help. This was on 16 January of 2016. 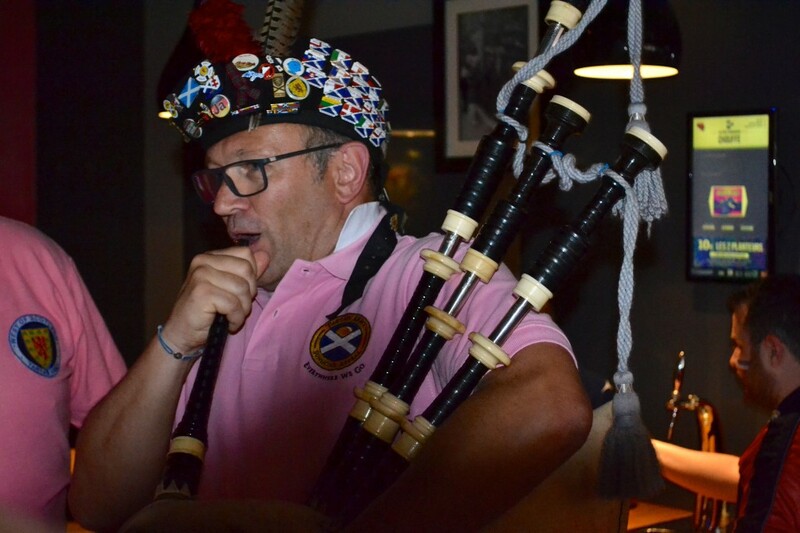 Didier is a founding member of Saint Galmier Tartan Army ( L’alliance franco-ecossaise de Saint Galmier – France). Initially begun with the visit of two Scotland fans to his home during France ’98, SGTA was officially inaugurated in 2001. Each year in Saint Galmier, they have a “Scottish Weekend”. 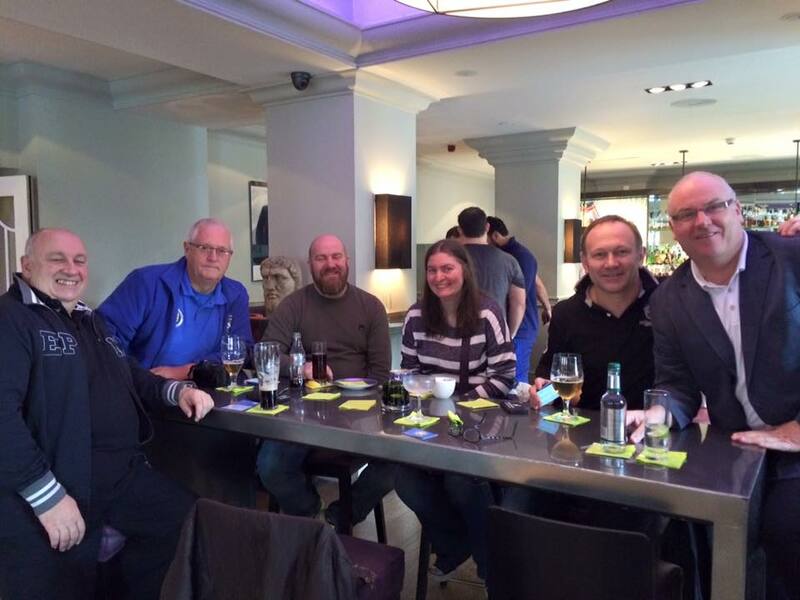 Some long-standing Scotland fans and friends of Didier travel across for a bit of a hoolie. Normally, the Caledonian Brewery Pipe Band is in attendance, too. I’ve never been but, by all accounts, it’s a great weekend. Interestingly, a group of young lads from Stirling Albion would be visiting Saint Galmier just after our visit to France, to take part in a football tournament. So, Scotland WOULD be represented in France during the Euros. 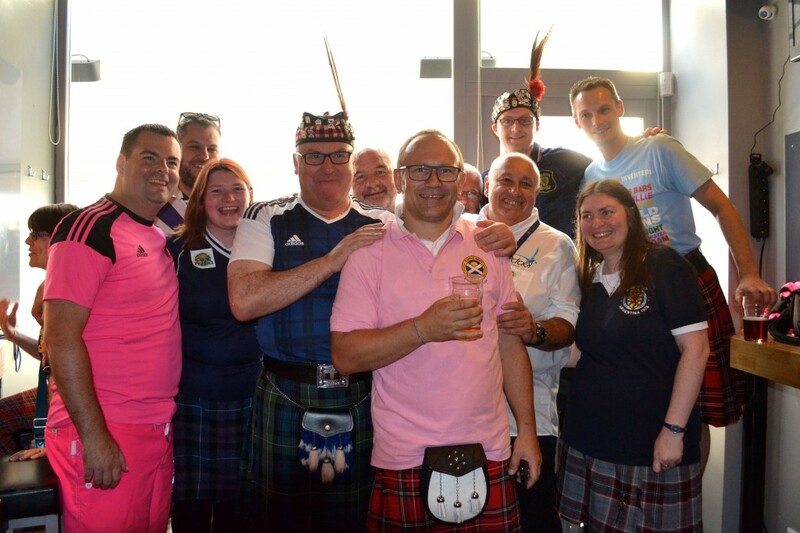 This group of troubadours have supported Scotland for years, often travelling to Hampden for “Home” matches and making their way to parts foreign as well. Didier didn’t disappoint. He came up with Rafael-Lorraine. That description struck a chord – “We hope to illuminate their faces”. How like the Sunshine Appeal’s own aim of “to bring a little sunshine to the lives of children” does that sound? It was a perfect fit. Didier had made contact with the main people of Rafael-Lorraine and told them about the Sunshine Appeal and our wish to donate some money to them. They were delighted – and not a little puzzled. On the eighth of February, the French Football Association (FFF) confirmed the match. We were good to go. We were put in touch with two people from Rafael-Lorraine – Denis Bettinger, their President, and Gilles Rolles. Gilles would be the main contact point. 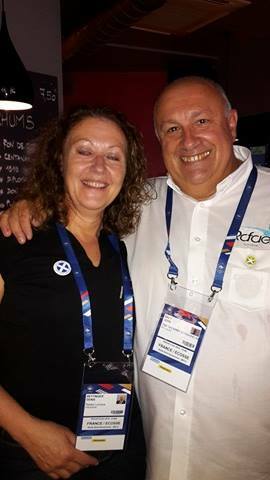 As luck would have it, both men, their spouses/partners and some friends were coming to Scotland to see France play Scotland at rugby (a sport played by men with funny-shaped balls). Myself, Neil Forbes (Vice-chairman) and Monica Devlin (Steering Group member) arranged to meet with them. We met in the bar of the Balmoral Hotel and quickly retired to a nearby restaurant for lunch (well, have you seen the prices in the Balmoral?). We discussed our respective charities and how we seemed to suit each other and made tentative plans for our meeting in Metz in June. Over the next few weeks and months we kept in touch. It seemed that Denis had contacts in the upper reaches of FFF and was not frightened to exploit them. Our AGM was held in April and we decided that charity donations would remain at £5000 per match. If I may digress a little here. This was a major decision for the Sunshine Appeal Steering Group to take. Knowing of six away matches before the end of 2016, and knowing our level of funds, an easier decision would have been to reduce the level of donations from 2015’s high of £5000. But the Steering Group decided to maintain the level of donations and hugely increase fundraising activities. This can be difficult because there are many organisations trying to tap into people’s limited funds, but especially because some are trying to tap into the Sunshine Appeal’s historical pool of supporters – the Tartan Army. We felt, however, that our traditional supporters would rally round and help fund the only Scotland fans’ charity that donated to a children’s charity EVERY time that Scotland plays an away match. Not for nothing is our strapline “Everywhere We Go”. But, back to Rafael-Lorraine. When we communicated to them what the amount of donation was to be, they were delighted. With Steering Group members arriving in Metz from different places and at different times, not even taking into account the strikes by Air Traffic Control and the railways, not to mention widespread flooding (I said not to mention that! ), we agreed to meet up on the Saturday afternoon. 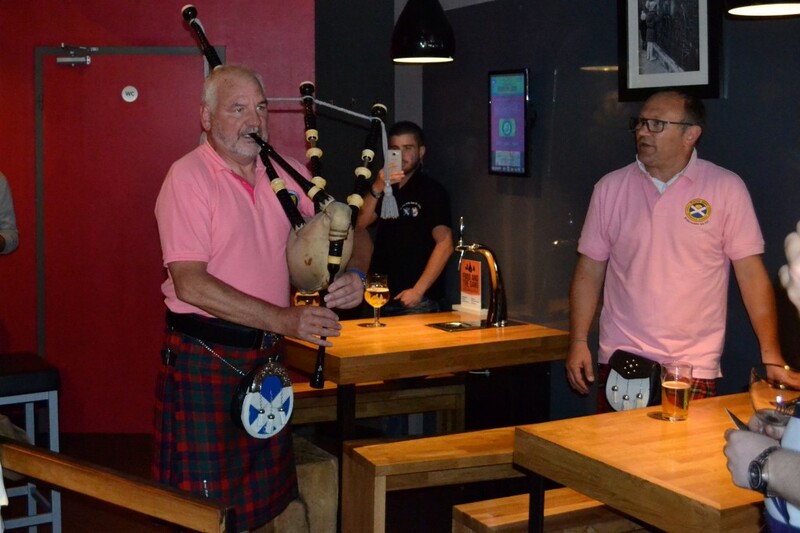 Denis and Gilles had organised a Private Function for a couple of hours in a pub in the centre of Metz called “Le fut et a mesure”. In preparation for the event, I had employed my best Blue Peter technique and created a large cheque to take to France. I took a photo of it and posted it on Bookface. And so, we were off. I was driving to Metz so we were not space restricted. In went the Sunshine Appeal T-shirts and Polos. In went the luggage and in went the cardboard cheque envelope. Remember when I said I had taken a photo of it for posting on Facebook? Well, I hadn’t put the cheque back in the envelope! Quelle catastrophe! I quickly called Gilles who took it well. “It’s more important that you are here than the “false cheque”. I thought that was nice of him. Had I not been so embarrassed, I would have been raging. We checked in, made our way out and met up with Neil Forbes and Rodney Shearer and his wife Belle, before heading to the rendezvous (see what I did there?). The weather in Metz had been mixed according to some who had arrived before we did, but there was no doubting the hospitality of the Metz locals. Denis and Gilles (and Stefan the bar owner #NoStefanNoParty) had arranged free drinks and snacks for our visit. 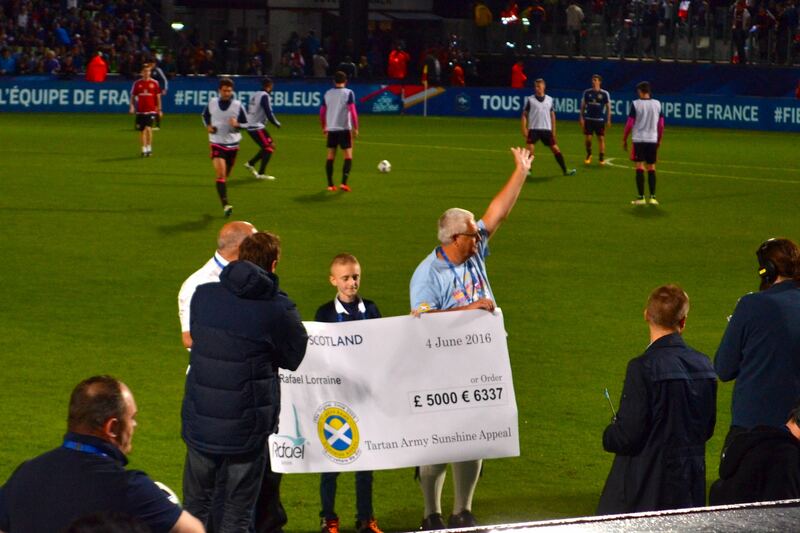 They had also arranged for a Press Photographer to be there to take a photo of the cheque. The one that wasn’t there. Cue photo sans cheque. Everyone met everyone, drinks were poured and chatter abounded. I showed Gilles the picture of the cheque that I had taken and he had the idea to take it to a local printing shop to see if they could replicate it. They could and did! Gilles had saved the day and produced an enormous “false cheque” for the presentation. Speeches were made, gifts were exchanged (and many thanks to Mark Perkiss for his donation of a Scotland top to Rafael-Lorraine), national anthems were sung (and if you think Flower of Scotland is a bit on the battle-celebration side, you should read the words of La Marseilles), pipes were played (thank you, Dougie Wotherspoon), and a good time was had by all. Didier Martinet was in attendance and was duly thanked for his part in introducing the two organisations. 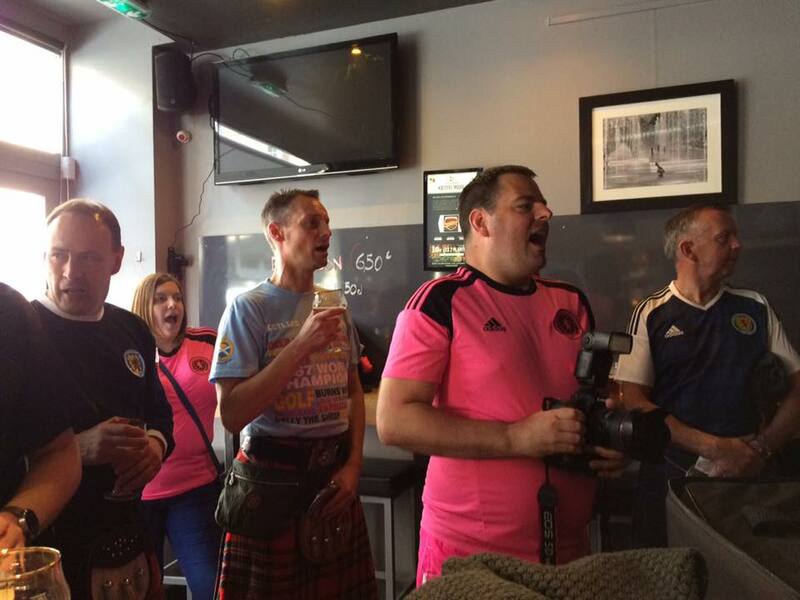 During our (absolutely magnificent) rendering of Flower of Scotland, one lady was seen to be weeping. I thought “Our singing wasn’t that bad”, so I asked her why she was showering tears around the place. I’ll leave the description of another insipid, cringe-worthy, embarrassing, inept, dull, bland wishy-washy, characterless, colourless, tame, unexciting, uninteresting, boring and lifeless Scotland performance to those who know more about football than I do. I don’t want to express an opinion. Denis had arranged for the presentation of the huge substitute cheque to be made on the pitch at half-time. We had to ticket-swap, so that me, Marion and Neil could be in the main stand to make pitch access easier. In order to be allowed access to the hallowed playing surface, normally graced by the god-like players of Metz FC, I had to have accreditation. I sent my details to Gilles as requested, but thought that his remark about my photo and prison was uncalled for. 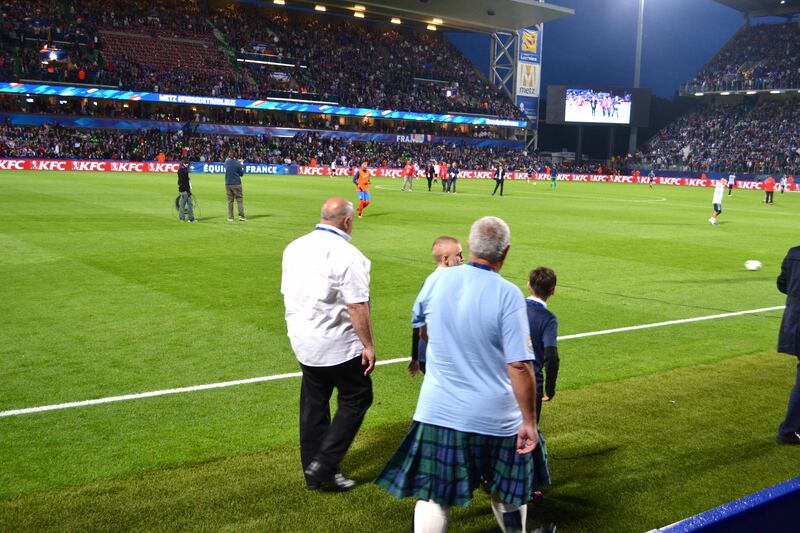 Anyway, half-time duly arrived and Denis and I, and two of Rafael-Lorraine’s beneficiary children, Travis and Johan, were escorted onto the pitch to the halfway line. Back to the stand. The game duly played out and we retired back to “Le fut et a mesure” for a nightcap. We said our goodbyes, au revoirs and cheerios and another Tartan Army Sunshine Appeal donation was over. NB – No mention has been made in this report of the cherry beer victim, the Steering Group member who couldn’t count to 9, the forgotten jacket, or other incidents. To protect the guilty.